Netgear's ReadyNAS 3130 is an impressive performer with a wide-ranging feature set and some good software, plus it's relatively affordable to boot. The ReadyNAS 3130 is a 1U rack-mount enterprise-class storage device. It's sold in a diskless configuration with space for up to four hard disks. The documentation suggests an official maximum capacity of 24TB, by using 6TB disks, although there's no reason it shouldn't work with 8TB disks (such as Seagate's Archive V2 ST8000AS0002) for a total of 32TB. It's powered by an Intel Atom C2338 processor running at 1.7GHz, with 2GB of ECC memory, expandable to 16GB. The specification suggests a maximum of 75 users, which is what could be called a small-to-medium sized organisation, although the feature set is ideal for home users who are particularly enthusiastic about a solid storage setup as well. Online prices vary, but at around £600 (we found it for sale at $886 in the US, which translates to around AU$1280) it's just about affordable as a high-end home NAS as well. At its heart is Netgear's ReadyNAS OS software, currently at version 6.2, which is installed on pretty much every ReadyNAS product, although the 3130 has a few unique storage features. One of these is unlimited snapshots, allowing restoration of deleted files in both public and user storage spaces. Anti-virus, thin provisioning and iSCSI shares are integrated, along with remote access features such as Netgear's ReadyCloud, which works like a Dropbox-style shared space, but entirely hosted on your private network. We'll explore the software and of course the hardware in more detail later in this review, but first let's look at the design and setup of this Netgear offering. 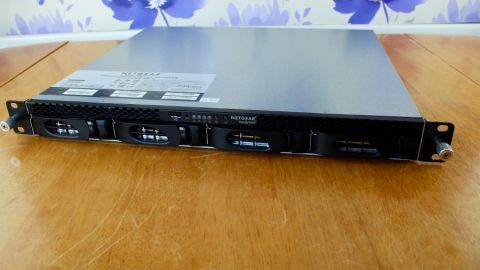 Typical of a rack-mount NAS, the ReadyNAS 3130 is quite deep, measuring 406mm from the front to the rear, 486mm wide, and 44m high. Not including disks, it weighs 5.21kg. A big accessories box contains screws and mounting brackets. The 180W power supply is internal meaning only an IEC 'kettle' lead is required to power it. Attaching the drives is as straightforward as most NAS units – you remove each bay by undoing a lever at the front, hook them out, screw in the disk, then put them back. There's support for 2.5-inch drives as well, so you can use SSDs if desired. There are three internal 40mm fans, a USB 2 port and USB 3 port for external storage expansion, and four gigabit Ethernet ports at the rear. There's no 10GbE support, a feature reserved for more high-end storage units, but 802.3ad LACP dynamic link aggregation is possible, along with a few other ways to bond the ports together. There's an option for Active Backup, Load Balancing, XOR, Round Robin and Broadcast. The most useful is 802.3ad – this will require a switch that also supports the technology. On initial setup, the 3130 will automatically choose Netgear's X-RAID 2 storage setup, a RAID 5 system that supports volume expansion, with one of the four disks reserved for backup. The alternative option is what Netgear calls Flex-RAID, a label for traditional RAID, where the user can choose RAID 0, 1, 5, 6, 10 or JBOD storage modes. With four 6TB disks installed, the ReadyNAS was left with a total of 17.94 TB of usable capacity, or 16.3 TB in Windows. Obviously a RAID 0 array will give you more capacity but with a much greater risk of data loss in the event of hardware failure.